NEGROMANCER 2.0: Titan Comics Announces Convention Edition of "Torchwood #1"
Titan Comics Announces Convention Edition of "Torchwood #1"
BBC Worldwide and Titan Comics are excited to announce the hotly anticipated new ongoing Torchwood comic series will debut at this year’s San Diego Comic-Con, supported by special guests including Captain Jack himself, John Barrowman, and Carole E. Barrowman. Torchwood #1 sees Captain Jack come back to Cardiff to engage the help of the last person who expected to see him again, Gwen Cooper. On the road, on the run, and under fire – can Jack and Gwen put aside their differences and rebuild the heart of Torchwood… before its flame is stamped out forever?! Alongside the regular edition (in comic book stores August 3, 2016), Titan are proud to present a special convention edition of Torchwood which includes the entirety of Torchwood #1 plus extra fan-favorite John Barrowman and Carole E. Barrowman-penned adventure “The Selkie”, with art and a brand-new cover from comic book legend Tommy Lee Edwards (Batman, Hellboy). These regular and special editions are available to purchase at the Titan booth #5537 at San Diego Comic-Con 2016. John Barrowman and Carole E. Barrowman will be guests on a special Titan panel where fans will be treated to announcements, behind-the-scenes reveals and upcoming plans for the Torchwood comic series. This panel will take place on Saturday July 23, 2016 at 3:30PM in room 5AB. 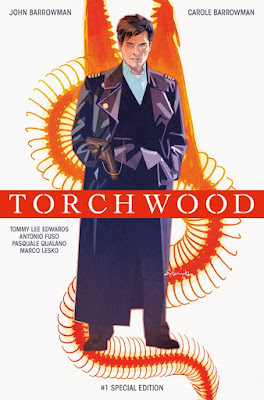 Fans will also have the opportunity to meet John Barrowman and Carole E. Barrowman at the show as they will be signing copies of Torchwood #1 on Sunday July 24, 2016 between 11:00am and 12:00pm at Autograph Area, Table AA21. To find out more about Titan Comics and their plans for San Diego Comic-Con, follow on Facebook, Twitter and Tumblr.